DwellClick (Mac App Store link) allows you to navigate your Mac with your mouse without clicking. It works surprisingly well. After you turn on DwellClick, the utility tracks your mouse cursor across the screen. When you place your cursor on, say, an application icon and wait for a second, DwellClick kicks in and opens that application for you, all without you actually clicking on your mouse buttons. The process of clicking without actually clicking is strange at first, and there is a bit of a learning curve with DwellClick. Thankfully, the developer, Pilotmoon Software, includes step-by-step instructions on how to tailor DwellClick to your needs. DwellClick has options to change how long the software waits until it performs a click. DwellClick also supports tasks such as dragging and right clicking functions, which makes the software more useful. To perform a double click, drag, or right click, you hold down the Function key (Fn on your keyboard) when DwellClick is active, and a pop-up panel appears where you select the action you want to perform. Though this method is less efficient than using your actual mouse buttons, the DwellClick pop-up panel method does work well. Although DwellClick can useful, there are surely times when you won’t want its functionality in every program. DwellClick contains an apps feature for times when you want to run the utility but prohibit it from running within certain applications, such as games. This feature worked well when tested. 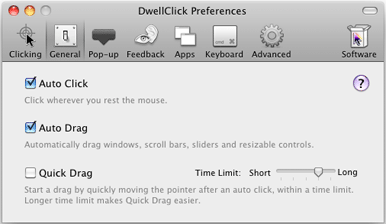 While DwellClick may not seem more efficient than using your actual mouse buttons, it may help when using a trackpad.